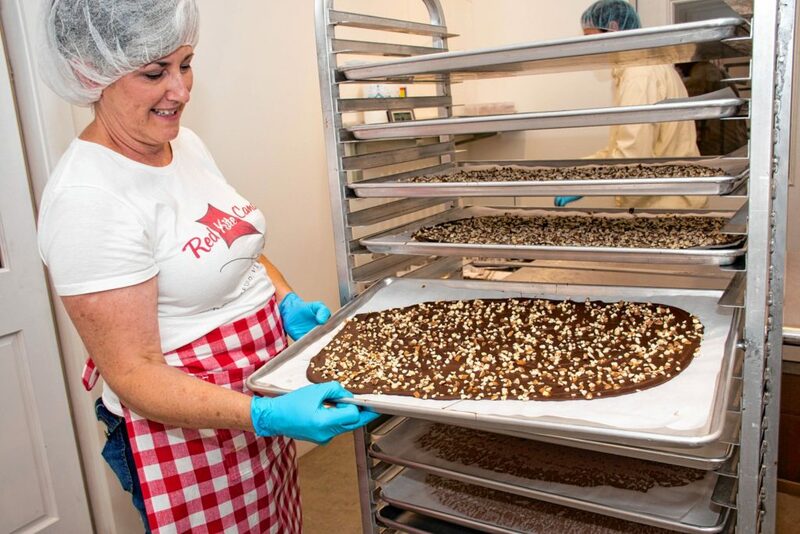 Red Kite Candy Co.’s Elaine McCabe places chocolate-coated toffee on racks to harden. After cooling for about an hour, the toffee will be flipped and the second side will be coated with Belgian chocolate and roasted organic almonds. Nancy Nutile-McMenemy photograph. 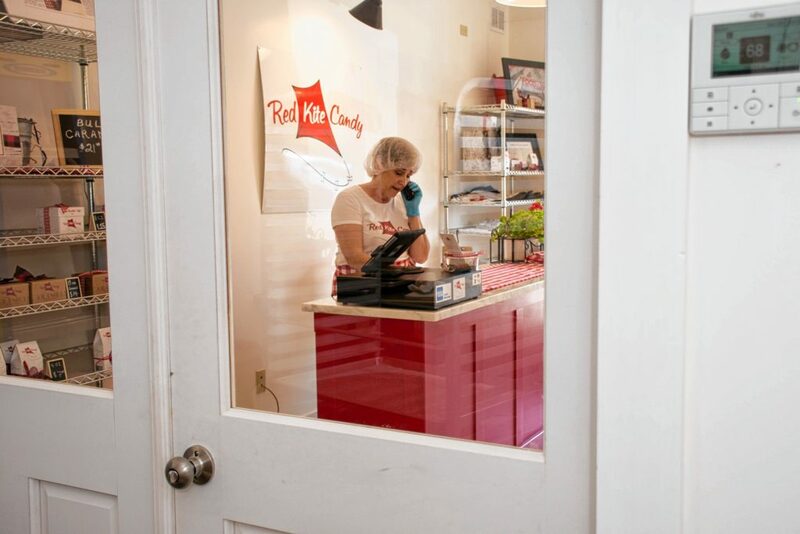 Elaine McCabe, owner of Red Kite Candy Co. in Bradford, Vt., takes a phone order. Nancy Nutile-McMenemy photograph. ( Meet the mccabes Thetford Center residents Elaine and Mike McCabe are the owners of Red Kite Candy Co., which sells handmade toffee, caramels and nougat. The couple in October 2015 opened a retail shop in Bradford, Vt., and already is planning to expand the space. Nancy Nutile-McMenemy photograph. When Elaine McCabe was at her most vulnerable, she allowed her daydreams and passion for crafting confections to take flight. Today, the sky is the limit for the Red Kite Candy Co.
McCabe’s “aha!” moment came in 2007 during a treatment following a diagnosis of cancer. Having spent three decades making annual holiday toffees and caramels for friends and family, her entrepreneurial lightbulb illuminated. 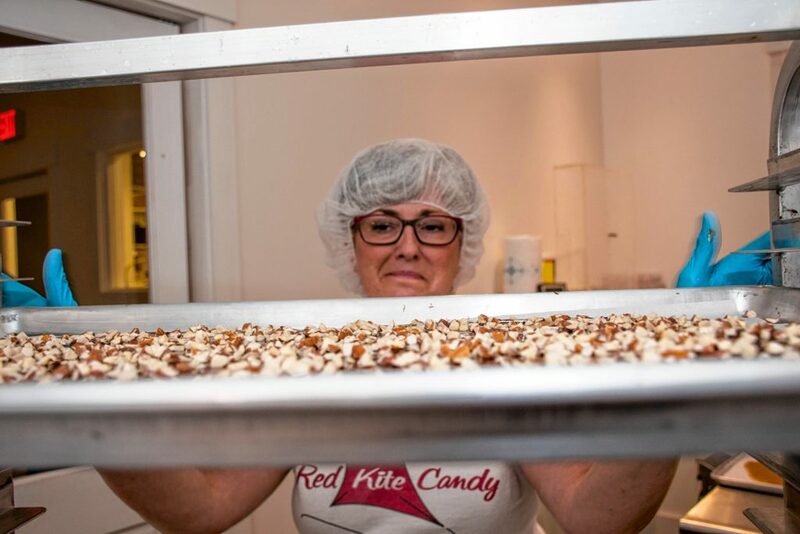 With three young children at home, McCabe, with the support of her husband, Mike, planned out a two-year timeline for a business venture before officially launching Red Kite Candy in 2009. “I never wanted to turn my hobby into a business, but that changed in an instant when I starting thinking (about my mortality) and realized I love making candy and it’s fun, so why not give it a go? ” McCabe recalled. The SCORE workshop covered topics such as identifying a legal structure for the proposed business, business planning, building sales, record keeping, cash flow and financing. With the validation of SCORE members and others who attended the workshops looking to start their own businesses, the McCabes transformed their Thetford Center home to start the operation, upgrading to a certified commercial kitchen and occupying a majority of their basement for operations and storage. They began locally sourcing the ingredients and set out to put operations and marketing into place. Red Kite Candy took off in 2009 with product first sold at local farmers markets and gift shops in the Upper Valley. Today, hundreds of thousands of the confections — each individually wrapped in red — are consumed, not only throughout Vermont but in stores like Whole Foods and through online sales from around the world. How did the company go from sourcing and selling to consumers in its own backyard — at locations like King Arthur Flour, Woodstock’s F.H. Gillingham & Sons and the Co-op Food Stores — to reaching the taste buds of customers around the globe? Elaine McCabe recalled one key marketing moment. Little did the McCabes know how influential that review would be. “Getting written up in the Times resulted in hundreds of orders that first week and a rush we were not prepared for,” she said. Like astute businesspeople, the McCabes focused on refining their systems; doing so eventually moved them to a new level, not to mention a new facility. Today, with their state-of-the-art candy kitchen and a modest storefront located across from Farm-Way on Industrial Drive in Bradford, Vt., Red Kite Candy is selling 10 times as many caramels, toffees and chews as it did in its humble beginning. The new operation is bolstered by a $60,000 German-designed machine that cuts and wraps caramels, as well as a FireMixer cooker mixer to enhance output and operations. The McCabes pride themselves on the ideals of the Green Mountain State and feel fortunate to live among their suppliers and be a part of a network of local farmers, artisans and craftspeople who care deeply about their trades. From obtaining local ingredients to playing a small role in preserving the environment, the candies are prepared with 100 percent organic milk and cream, European-style cultured butter, eggs, honey and award-winning local maple syrup, while their packaging — a fitting red wrapping — is made from plant-based material. Prior to making a home in Vermont, the couple, married since 1988, traversed the country thanks to a variety of jobs that enriched their business acumen. Elaine McCabe worked in packaging and merchandising, where she helped design stores. Mike McCabe, who previously worked at Enron, also held positions in surveying and mapping before joining the Red Kite Candy Co. full time in 2012. Elaine McCabe manages the company’s branding and marketing, but it’s her creativity and attention to detail that are most evident, whether it’s in the company’s name (derived from one of her favorite childhood memories of flying a homemade kite from the corner store of her Richmond, Ind., home with her late brother, Stan) or her packaging flair, from wrapping hundreds of gifts for weddings and special events, to her focus on the company’s website. Mike McCabe complements those talents as the company’s financier, managing the books, projections and business planning and development. 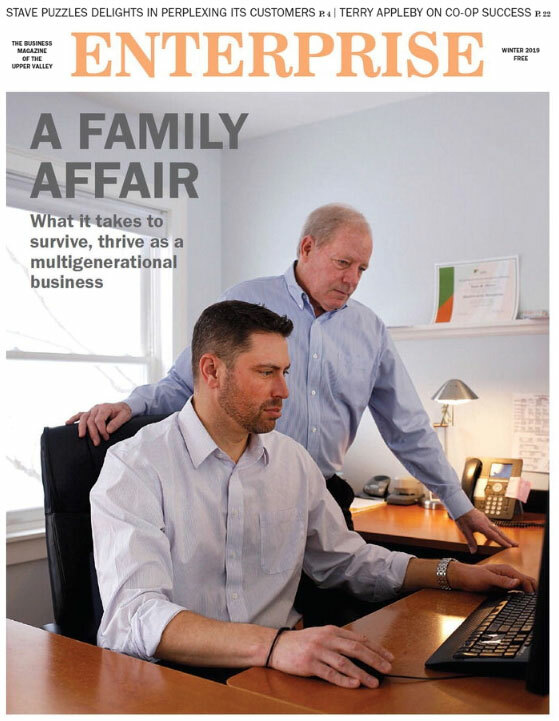 The McCabes, parents to three children (two sons and one daughter — Caila, Max and Jack), still reflect on the company’s growth, along with their commitment to customers. “If we weren’t producing a product that made people this happy, I don’t know that we would be this motivated to work as hard as we do,” Mike McCabe added. Lynn Luczkowski is president of L2 Communications, a full service public relations, marketing communication and social media agency in Quechee. She can be reached at Lynn@L2comm.biz. Editor’s note: SCORE is a nonprofit SBA-associated organization. The Upper Valley SCORE chapter has more than 30 experienced volunteer mentors. In addition to free mentoring, the chapter provides workshops throughout the year. For more information, visit https://uppervalley.score.org, email uppervalleyscore@gmail.com or call 603-448-3491.